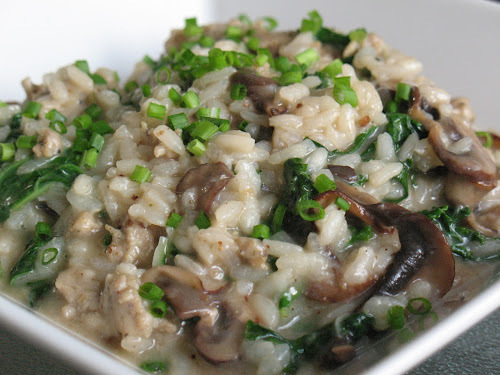 Risotto is one of the most versatile dishes. It can serve as the platform for any multitude of combinations of vegetables, cheeses and meats, even dried fruits. Although it's pretty hearty, seasonal summer vegetables lighten this dish, making it a perfect patio meal for a breezy summer evening. This recipe from the Tiniest Kitchen blog was precisely what I was looking for to use up some extra kale. I didn't do a lot with it, other than replace the cup of water with chicken stock and add some fresh chives at the end. Although, I will say that her direction to stir the dish constantly is not actually necessary. I make risotto all the time by stirring occasionally. You can stop and do other things. Your risotto will still turn out great. Any mushroom would probably be good in this. Cremini (also known as "baby bella" since they are portobello mushrooms picked early) are easy to find and have a heartier flavor than typical white mushrooms. 1. In a large saucepan, warm chicken broth over medium-low heat. 2. In a large pot (cast-iron dutch oven or steep-sided sauté pan), heat olive oil over medium heat. Sauté mushrooms until browned and set aside. Add sausage to pot and sauté until browned, breaking it up as it cooks. Add shallots and garlic and cook until softened. Add rice and sauté a few minutes until some grains show a little color. 3. Add wine to pot and cook, stirring constantly until the wine is absorbed (you can tell when this is by scraping away some rice from the bottom of the pan. If it doesn't fill in immediately with liquid, it's absorbed). Add 1/2 cup of the chicken broth and cook until absorbed, stirring occasionally. Keep adding broth in 1/2-cup increments, cooking and stirring until all the broth is added and incorporated. At this point, the rice should be firm but cooked and coated in a creamy sauce. Add the kale and stir until it wilts. Stir in the cooked mushrooms, parmesan and pepper. Serve topped with fresh chives. This was really good. Delicious and filling. Thanks for making it, dear.